Habit: Plant < 1 m. Stem: prostrate to ascending; nodal spines 3--9; internodes bristly. Leaf: blade 3--5 cm, deeply 3--7-lobed, hairs 0 or sparse, nonglandular, adaxially dark green, abaxially light green. Inflorescence: 5--15-flowered; pedicel jointed to ovary. Flower: hypanthium 1 mm, saucer-shaped; sepals 1.5 mm, green, purple, or cream with darker veins; petals 1 mm, purple; styles free to base. Fruit: 4--6 mm, black; hairs glandular. Chromosomes: 2n=16. 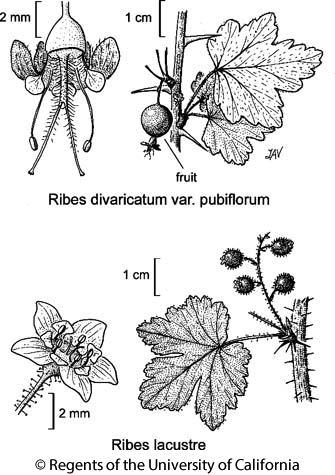 Citation for this treatment: Michael R. Mesler & John O. Sawyer, Jr. 2012, Ribes lacustre, in Jepson Flora Project (eds.) Jepson eFlora, http://ucjeps.berkeley.edu/eflora/eflora_display.php?tid=41413, accessed on April 19, 2019. KR, NCoRH, CaRH; Markers link to CCH specimen records. Yellow markers indicate records that may provide evidence for eFlora range revision or may have georeferencing or identification issues. Purple markers indicate specimens collected from a garden, greenhouse, or other non-wild location.